Research has grown to support that the diversity and sheer number of probiotics in your body may contribute to its capacity for digestive and immune system functionality. Natural micro flora cells outnumber other cells by nearly 10 to 1 in the human body. Scientists are recognizing that our intestinal colony of beneficial flora is so essential to human health, that the flora functions like a human organ. The latest research by the Institute for Genomic Research estimates that a healthy "flora organ" contains approximately 1,000 species and trillions of microbes. The importance of this flora organ theory is also supported by a 2007 National Institutes of Health initiative to map the natural flora in or on the human body called the Human Microbiome Project. Every day, the good, natural flora in your body is killed off by stress, poor diet, medications such as antibiotics, chlorinated water, and anything toxic in your environment. You may take a daily multi-vitamin and mineral supplement because your body needs all its vitamins and minerals. You should consider taking a daily multi-probiotic supplement for the same reason – Probiotics can replenish the flora colonies that your body needs for optimum health. 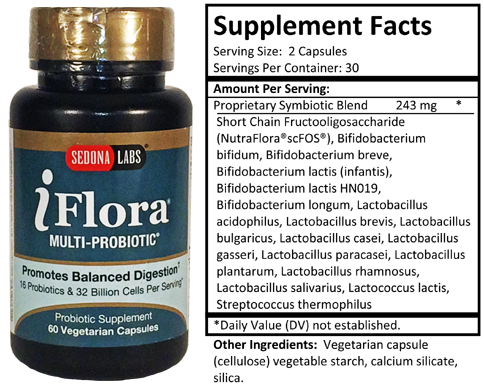 What is special about EHP Products’ iFlora® Multi-Probiotic® capsules? iFlora© Multi-Probiotic® capsules are made by Sedona Labs of Cottonwood, Arizona, a leader in digestive and immune health. Over twenty years ago, Sedona Labs developed its proprietary multi-strain probiotic blend and we are proud to offer it in a vegetarian, dairy-free, and shelf stable form. Every capsule contains 16 strains of probiotics that supplement natural flora colonies: nine lactobacilli, five bifidobacteria, one streptococcus, and one lactococcus. All of the strains survive the stomach acid in the digestive system. This formula provides 16 billion cells per serving and is one of the most diverse probiotic products available. *The FDA has not evaluated these statements. The product is not intended to diagnose, treat, cure, or prevent disease.